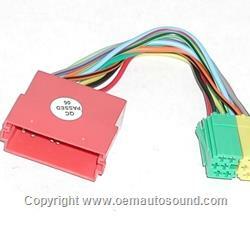 Audi Symphony radio in particular, has a solid 20-pin plug that make it impossible to connect aftermarket equipment to the radio. Customers who wish to connect aftermarket adapters to 8-pin section of this plug must purchase the AA3-HAR. To use the AA3-HAR you must disconnect the solid 20-pin plug from the radio and plug it into the red connector on AA3-HAR, the yellow and green plugs on the AA3-HAR plugs into the radio. The 8-pin port (to the far right) is now open. Audi vehicles with the Symphony radio include: A4, A6, A8, Quattro etc. and the word "Symphony" is usually printed on the cassette door.